It has been suggested that America is going to Hell in a hand basket. While most of the conservative community would agree with this sad assessment, few of us are willing to point out the root cause for our culture's ignorance of the Creator's values. If America's Christians are going to act decisively, repent of our sins, and humble ourselves before the One Who stands behind the thrones of men (2 Chronicles 7:14, Romans 13), we must expose those who are facilitating a pick-and-choose approach to Scripture. Consider the social ills that are encouraged by the hermeneutics of selective obedience. If Acts 2:38 doesn't really mean what it says (baptism is "for the forgiveness of sins," NIV), then why shouldn't our culture distrust the conclusions of other passages? Maybe abortion isn't wrong and Proverb 6:16-19 ("hates... hands that shed innocent blood," NIV) doesn't really mean what it says. Maybe homosexuality isn't wrong and Romans 1:27 ("shameful acts," NIV) doesn't really mean what it says. Maybe feminism isn't wrong and Ephesians 5:22 ("Wives, submit yourselves to your own husbands as you do to the Lord." NIV) doesn't really mean what it says. Maybe living together before marriage isn't wrong and Hebrews 13:4 ("Marriage should be honored by all, and the marriage bed kept pure, for God will judge the adulterer and all the sexually immoral." NIV) doesn't really mean what it says. Maybe disrespecting authority isn't wrong and Romans 13:2 ("...whoever rebels against the authority is rebelling against what God has instituted." NIV) doesn't mean what it says. When the church lowers the bar of biblical authority to the level of selective obedience, a very slippery slope is introduced to the world. Culture will quickly capitalize on that open door and rush to justify any sin they choose. It does not matter if Catholicism, Reformed Theology (Calvinism repackaged), or any other denomination claims to oppose these social ills; their actions speak louder than words! Their pick-and-choose approach to Scripture sets a humanistic precedence that is responsible for prompting perverse conclusions from those who are searching for validation. Those who refuse to accept the most basic, most obvious command of the very first invitation from the very first sermon on the very first day of the church ("be baptized ...FOR THE FORGIVENESS OF SINS," Acts 2:38, NIV) are the ones guilty of lowering the bar and facilitating our culture's moral rebellion against the Creator. But what's that you say? "Sonny, stop being so negative! Stop being so confrontational!" The reason we are so uncomfortable with confrontation is that we don't understand the confrontational Christ. For centuries, false teachers have mis-characterized the nature of Jesus in order to justify their own misuse of His authority! The Christ is NOT a mild-mannered Messiah Who preached pampered doctrines of grace without responsibility. Catholicism, Calvinism, and denominationalism have so sissified the Savior, we barely recognize His true nature! Because of their misrepresentation of the biblical record, Christ-like confrontational preaching is now persecuted. It is rejected as ineffective in order to promote unity, rather than accepted as the example of Christ in order to promote cleansing. Fact: While Jesus had great compassion for those who were like "sheep without a shepherd," He had little patience and great disdain for the false teachers who "harassed" them (Matthew 9:36, NIV). Consider the cleansing of the temple (John 2:13-17). Reflect on Christ's sharp rebuke of the "brood of vipers" (Matthew 23:33, NKJV). Think of how He intentionally created controversy in order to expose false teachers (Mark 3:1-6). Even His "chosen vessel," (Saul/Paul) was knocked to the ground and blinded on his journey out of false teaching (Acts 9:1-22, KJV). No, Jesus is nothing like the ear-tickling, grace without responsibility, pamper-peddling preachers of modern day Christendom. It is time we rethink the image we have of the Christ. Jesus is nothing less than the Lion of Judah and, be warned, He will one day, very soon, return as the Militant Messiah. He will take vengeance on those who have misrepresented Him and will banish, into Hell, those who have stubbornly refused to look beyond human doctrine and study for themselves (2 Timothy 2:15, 2 Thessalonians 1:6-9). The Lord has nothing but pity and compassion for those who are harassed, and nothing but disdain and harsh condemnation for those who are harassing! 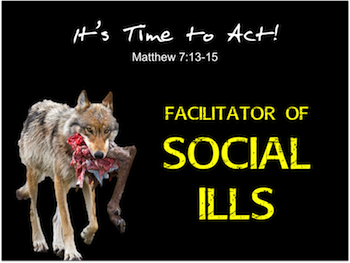 The American culture has fallen prey to the devastating social ills listed above because false prophets (Matthew 7:13-15) have been allowed to prey on the American culture. We have demonized the confrontation of sin and popularized the doctrine of grace without responsibility ("Unconditional Election," "Irresistible Grace"). 2 Thessalonians 1:6-9 (NIV) "God is just: He will pay back trouble to those who trouble you and give relief to you who are troubled, and to us as well. This will happen when the Lord Jesus is revealed from heaven in blazing fire with his powerful angels. He will punish those who do not know God and do not obey the gospel of our Lord Jesus. They will be punished with everlasting destruction..."
For the spiritual well-being of our family and friends, it is time to expose the false teachers. It is time to act! "It's Time to Act! "2 - Drain the Swamp"
Back to Top of "It's Time to Act! 1"